MACAU/ZHUHAI, China (Reuters) - China's crackdown on corruption and conspicuous consumption is ever more visible in its impact on Macau, the world's biggest gambling hub, which makes most of its money from the high rollers who are staying away to avoid Beijing's scrutiny. During a recent visit to four of the city's glitziest casinos, VIP rooms were mostly desolate, with some shuttered and one boarded up, their tables covered with wood and white cloth. At nearby pawn shops and jewellers, used by many gamblers to evade China's strict currency controls, and at money remittance agents in the Chinese border city of Zhuhai, there are fewer customers about. In February last year, operators of the Chinese-controlled enclave's 35 casinos were riding high, their revenues for the month up 40 percent year on year. This year, February revenues are expected to fall 40 percent, having fallen in each of the previous eight months, too. The trend is set to continue despite increasing numbers of Chinese tourists crossing the border during the Lunar New Year holidays. "This is a very dangerous time," said Johnny Fok, one of over 100 junket operators in Macau that extend credit to wealthy punters and arrange transport and accommodation. "It seems President Xi really doesn't want people to come and gamble any more ... Maybe we have to wait seven more years, then, after Xi has left, and only then, we might have a chance for things to go back to the old days." China has beefed up its anti-corruption monitoring network in Macau with staff from the Central Commission for Discipline Inspection and other agencies now permanently based in the local liaison office, according to a regulatory official and junket operators. Fok's business has slumped 70 percent in the past two months compared with a year earlier. 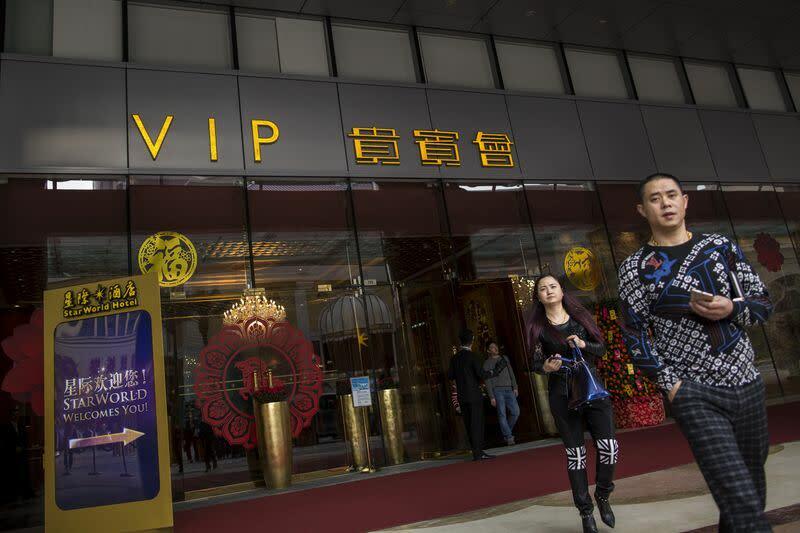 Three of the top 10 junket companies have closed some of their VIP rooms in the last three months as Beijing's anti-graft campaign bites. "For the next three months China will continue to crack down on Macau," said Lei Kuok Keong, a leader of Macau union Forefront of Macau Gaming, which represents junket workers and casino dealers. "For VIP, it is more serious. Many more VIP rooms will shut." Phone betting, where a gambler in China calls a junket in Macau, and side betting, where gamblers bet several times the table stakes, has also tumbled due to increased scrutiny from Beijing, said Lei. In an underground mall in Zhuhai, remittance agents, who help punters transfer money in and out of Macau, say banks are imposing tighter monitoring on large transactions, including on China's state-backed debit and credit card UnionPay, with amounts of HK$100,000 ($12,892) now requiring identity checks and verification. That deters those wanting to remain anonymous. Four shops had their shutters down around the old Lisboa casino, though most pawn and watch shops still offer illegal cash-back services, letting punters swipe their cards for fake jewellery purchases to get hard cash. At the Blessing Watches and Jewellery outlet in the Venetian casino, a store manager said amounts well above permissible limits could still be swiped using UnionPay cards, though some transactions might be split into smaller amounts to reduce the risk of detection. "We had a client who swiped HK$1 million three days ago," he said. Just across the casino floor, an electronic notice states that credit or debit cards issued by mainland China banks are not accepted at the counters where customers buy their chips. Mass-market gamblers are still travelling to Macau, and casino executives hope they will make up for the fall in high rollers, but since VIP business typically makes up 60-70 percent of revenue, it is a big hole to fill. There will also be a lot of extra space to fill, with two new casinos from Galaxy Entertainment <0027.HK> and Melco Crown <6883.HK> opening this year in Cotai, a strip of reclaimed land joining two of Macau's islands. The strip has more under construction, planned long before the slowdown struck; the base of a half-size Eiffel Tower replica sprouts from the ground of U.S. gambling kingpin Sheldon Adelson's upcoming Parisian resort, and the emerging bronze facade of Steve Wynn's new multi-billion-dollar casino will be fronted by a gondola and lake. Credit Suisse analyst Kenneth Fong says the downside risks, which could include a full smoking ban, are more apparent than the upside. Junket operator Fok scoffs at the idea that mass market gamblers could make up for the absent VIPs. "These small punters," he said, gesturing towards the sparsely filled gaming hall, "what they spend is not even enough to pay the electricity bills."